Hello dear friends. Barb and I are in Nantes. We have been shopping our way through the country. I can't post pictures here yet....but will soon. We will be back home Monday night and will have lots to report on Tuesday. 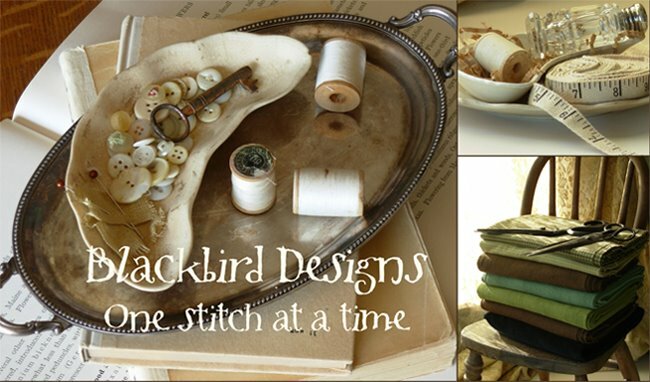 alma@blackbird-designs.com I have found some really fun things for the prize. So glad you're having fun! I would so love to go to Paris but will enjoy it vicariously through you! Have a safe journey home. I am sending my finished sampler pic along in a moment! SO glad you're having a great time!! Looking forward to seeing pics and hearing about your trip!! I hope to finish the stitching on my sampler this evening!! I'm stitching on the sampler. I hope sending it tomorrow or on Sunday. I'm looking forward to your report. Have fun! Hope you are having a fabulous time in France. I'm looking forward to seeing your pictures. Being in France must be like a dream! Enjoy the rest of your stay. I emailed you a photo of my Petites Lettres Rouges earlier this week. I thoroughly enjoyed stitching this little sampler and finished it into a pillow. Have fun and safe travel back home.Can hardly wait to read and see your french reports!Hugs Niky. I'm so glad you're having a good time. Can't wait for your report. it was SO nice to be able to meet you !! I posted some pictures on my blog !! You are so nice, so talented...It was like paradise. Hi Alma, I tried to send pictures of Petites lettres rouge sampler but....the mail came back I'll try again, hope you'll get it! Can't wait to see and read your report. just found your blog a few days ago.. i am certgian u are enjoying your trip.. please post some piccies when you can.. btw.. my sampler is finished.. its on my blog.. emailing you! Lots of my friends came to see you at the exhite in Nantes, they really enjoy meeting you there! I hope you enjoy my country as much I enjoy yours... have fun !!!! I have finished my sampler and have sent a photo. Sounds like a Terrific Time. Have lots of fun! I glad you're enjoying your trip. Have a safe journey home. I have only purchased the linen and floss for my sampler, but look forward to seeing everyone else's finished product! Due to work commitments, I missed the deadline for the contest, but I would still like to send you the picture when I am finished. I used 3 shades of teal for the letters and numbers and basic sampler and then used a teal overdye for the crow I added. It is so much fun to stitch. Thank you for the pattern. I did cross stitch years ago, but recently took it up again after seeing the Autumn Bouquet sampler hanging in a photo in your When the Cold Winds Blow book. I have so enjoyed the 'new' cross stitching, the charts, fabrics, threads...THANK YOU!!! I think I've already won MY contest! I have been looking on the different blogs at others versions of the contest piece and they are wonderful. Such inspiration! Thank you for having the blog!